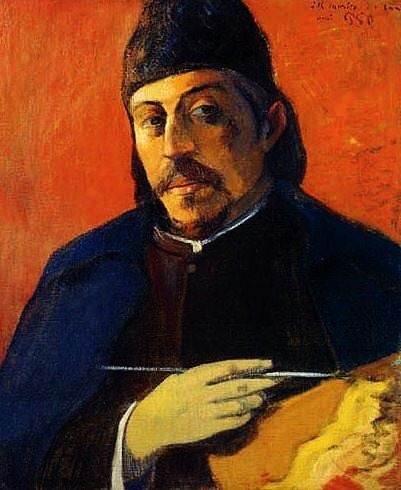 Well, it’s been a minute since I’ve written a solid article hating Gauguin, so here goes. In fact, the true subject is the artist himself. Like any monomaniac, Gauguin was in the Gauguin business, aggressively…It was a demanding job. It entailed not only creating art of extraordinary quality, but also inventing a persona with which to promote it. This entrepreneurial public role didn’t require that he be a nice guy, and he wasn’t. He declared himself a ”savage” by birth because, he said, he had South American Indian blood. (He was one-eighth Peruvian.) And he dressed the part. He grew his hair long, wore swashbuckling cloaks, home-boy hats and an expression — you see it in the self-portraits — of sly, intimidating disdain. Home-boy hats, ha! I’m impressed at this point. It’s like you’re wanting me to just keep hating you.